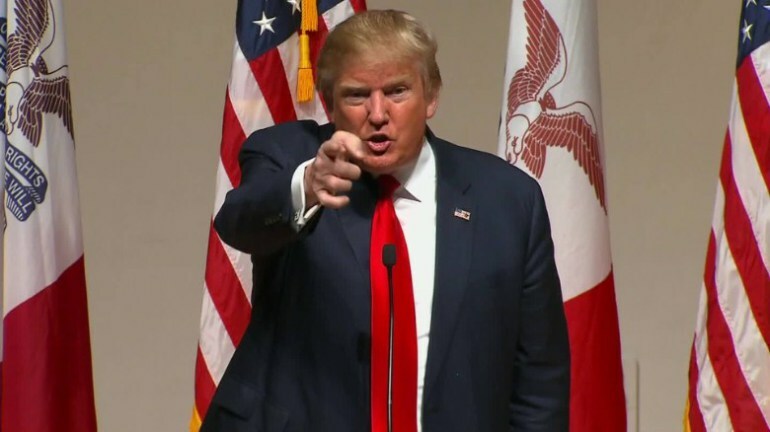 “I could stand in the middle of 5th Avenue and shoot somebody and I wouldn’t lose voters,” said Donald Trump recently. Fasten your seat belts, America. We’re in for a bumpy ride. The meanest kid on the block just took off the kid gloves and pulled out all the stops. Republican front runner Donald Trump’s recent boast at a campaign rally in Iowa that even if he were to shoot someone he wouldn’t lose the loyalty of his idiot supporters just exploded any remaining pretense of civil discourse this election season. Let’s take a closer look for a moment at Trump’s despicable claim. How convenient for the candidate to choose Fifth Avenue for his fantasy shootout. After all, if you’re going to randomly murder someone, why not do it on your own turf – right outside your own front door? Grab your firepower and a latte. Ride the private elevator down from your $100 million penthouse. Imagine the silhouette of your unsuspecting victim navigating the crowd down on the street below moments before they have the privilege of losing their life by your gilded hand. No need to take time out from your busy schedule to climb into the Escalade and have your chauffeur drive you to one of your other forty New York City houses and apartments on a less high-profile street. What a waste of time and gas. Besides, the photo op will be so much more dramatic when the body falls in a pool of blood on the sidewalk beneath the gold letters that proclaim your name. Oh, the wiliness. Oh, the disdain for decency and the sanctity of life. Trump’s brand of sneering chutzpah is beyond belief. Allow me the indulgence of delving a bit deeper into the appeal of Trump’s outrageously violent but psychologically clever fantasy. Unfortunately, Trump has the con man’s killer instinct for the power of subliminal suggestion. Trump’s choice of Fifth Avenue as the crime scene and his appeal to his supporters’ dislike of New Yorkers and what their city symbolizes is beyond brilliant. (Forget for the moment the inconvenient truth that this newly anointed populist hero is an examplar of New York’s wealthy super class.) That scary, multi-ethnic, multi-racial, multi-cultural, leftie, Jewish, Muslim, black, gay, transsexual, Latino, anti-gun, socialist brew provides the perfect target for Trump and his supporters. Giving a wink and a nod to the gun toters’ belief that guns are the sine qua non of what it means to be a patriotic American doesn’t hurt either. And don’t forget the scariest thing of all. Trump is a (serious?) candidate for the presidency who wants us to believe that his supporters are so fanatically enamored with the man and his hate-filled words that even if he’s a murderer they’ll overlook the loss of life and continue to give him their support. This is dangerous stuff, folks. To read another writer’s take on Trump’s latest bombshell—and laugh, rather than cry—here’s satirist Andy Borowitz from The Borowitz Report of The New Yorker. One day after Donald Trump claimed that he could shoot people on New York’s Fifth Avenue and not lose support, a leading member of the random-shooting community complained that the billionaire’s random-shooting plan lacks specifics. Moreover, he said, Trump has not put in the many years of solitary seething that most random shooters deem mandatory. Dorrinson added that although many random shooters have been in the Trump camp thus far, the candidate’s vague random-shooting “plan” is now giving them pause. Next Post:Is the country headed in the right direction?